What is the Calgary Fire Department? The Calgary Fire Department provides many emergency and non-emergency services around Calgary. Teams of firefighters respond to fires, emergency incidents, and motor vehicle collisions. Firefighters are working 24 hours a day at 39 fire stations around Calgary. Thankfully, this means that a firefighter team is always nearby when there is an emergency. If you have an emergency, always call 9-1-1. Right away, an emergency response team will head to your location. You can contact your local fire station directly if you need non-emergency services. 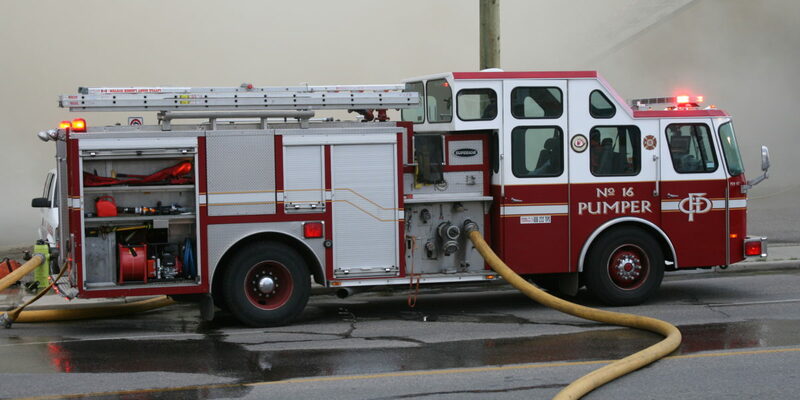 Click this link for a list of Calgary’s fire stations. Part of the Calgary Fire Department’s job is to educate the public about home fire safety. Do you have an escape plan if there is a fire in your home? Do you have working smoke alarms? If you live in an apartment, do you know what your building’s emergency escape plans are? Getting caught in a fire is a scary thought for all of us. Booking a tour at your local fire station is a great way to see how firefighting in Calgary works. On a fire station tour, you will get to meet firefighters and learn about fire prevention and safety. You can either call 3-1-1 or fill out a form online to book a tour. In cold weather, you can often see people “salting” driveways and sidewalks. To salt, people pour a coated gravel mixture on the concrete. Salting breaks down ice and snow, make it easier to remove and safer to walk. Salted gravel is available in sandboxes outside several fire stations. You will need to bring your own container to hold the gravel. Click here for list of Calgary Fire Stations that offer free salted gravel. The Calgary Fire Department works with the City of Calgary to offer drop-off locations for household hazardous waste. Examples of waste include paint, oil and chemicals – things that cannot be put in your regular garbage bin. More information on the program can be found here. Your can check your blood pressure at Calgary fire stations between 1 pm and 9 pm, seven days a week. You do not need to book an appointment. The process takes approximately 20 to 30 minutes. All fire stations, except for Airport Fire Station 13, offer this service.